These containers were used to mix drinks. Ice cubes were placed in the container then they were pulverized with the chippers, then the drinks mixed with the ice to make cool refreshing drinks that were poured into the drink glass. H - 11-1/2", Nine chipping picks. No other markings. 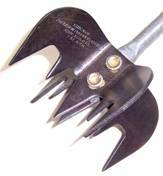 H - 13-1/4", Nine chipping blade teeth, Two other attachments; food chopper and strainer. Spout on side of top. H - 9-1/4", Nine chipping picks. PAT. PEND. On edge of the top. H - 8-3/4", Nine chipping picks. SCHULTZ BRASS MFG. CO. NORWOOD, OHIO, PAT. PEND. on top of pick support. Metal container. H - 9", Nine chipping picks. PAT. PEND. On edge of the top. H- 9", of the ice breaker only. Lightning ICE BREAKER label on the container. The red bands indicate 4-8-12 oz. and the capacity is 20 oz. is marked on the bottom of the container. 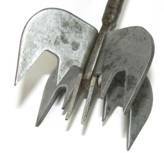 The chipper blades haves 9 points. The cylinder container is a shipping box (center) and display base for the ice breaker as shown to the right. . The small booklet depicts the ice breaker as a product of ENTERPRISE DIVISION OF THE SILEX CO.
Blue and white shipping/display container with cut out in the top to stand the crusher in for display. Display the ice breaker by removing the card in the top so the base of the breaker can be inserted. The top section of the container shows how to use the breaker as well different uses of the ice breaker. 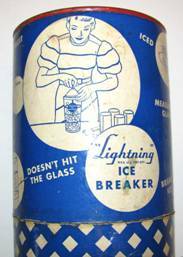 Lightning ICE BREAKER is on the front of the container and MADE IN USA BY NORTH BROS MFG CO. PHILADELPHIA 1935 is on the bask. The crusher has 9 points. NORTH BROS. MFG. CO. PHILA. PA. "LIGHTNING" ICE BREAKER NO. 102 MADE IN UNITED STATES OF AMERICA PAT. PEND. is around the outer edge on the under side of the lid. Two blue and one yellow ring around the glass container. 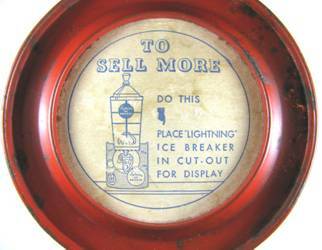 "Lightning" ICE BREAKER on round sticker on the side of glass container. On the bottom of the glass container is BANDS INDICATE 4-8-12 OZ. CAPACITY 20 OZ. 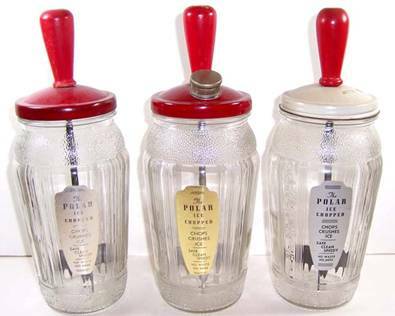 All three are the same height, have the same label on the container with the markings - The POLAR ICE CHOPPER, CHOPS, CRUSHES ICE, SAFE CLEAN SPEEDY, NO WASTE, NO MESS, and has the same type chipper with 10 bladed points. The differences are: the center one has pouring outlet in the top and a gold label and the other two have silver labels and no spout in the lid. The center and right ones have - CHICAGO PRECISION PRODUCTS CORP. CHICAGO, ILLS. PAT. APL'D. on the side of the chipping blade. The center and left ones have Duraglas 6 on the bottom of the container, whereas the one on the right has Duraglas 7. The one on the right is the only one to have 4 to 24 OZ markings on the side of the container. The screw-on lid on the one on the right is different from the other two as well as the color of the lid. Green handle, lid screws on and is yellow on the top and green around the rim. Red vertical and horizontal lines on the glass container with 6 - 28 oz. markings. Markings on the two chipper sections - CHICAGO PRECISION PRODUCTS CORP, CHICAGO, ILLS. PAT APLD, In the center of the bottom of the container are the numbers 7, 0, 12, around a symbol of an "O" over a diamond with letter "I". H - 12", Nine chipping picks. PAT. PENDING on underside of the pick support. H - 12", Nine chipping picks. PAT. PENDING on underside of the pick support. Alcoholic drink recipe and amounts shown on the side of the container. H - 11-1/2", Nine chipping picks. PAT. PENDING on underside of the pick support. Red and White checkered pattern around the bottom with three roosters evenly spaced above the pattern. H - 9", Four chipping picks. Markings on the label - ICE CUBE BREAKER and instructions how to use the tool. At the bottom of the label - ACME METAL GOODS MANUFACTURING COMPANY, NEWARK, N. J. - MADE IN U.S.A. DO NOT FILL ABOVE THIS LINE on the front and 2 to 12 OZ. level marks on the back of the container. 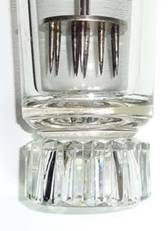 Markings on the bottom of the glass container are PATENT NO. 1890307 and an A over 5045 above 1. 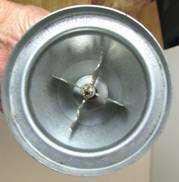 The patent number is for a container relating to a mixing device, especially for mixing drinks. Same as the one to the left without the label. Ten chipping points. FEDERAL TOOL CORP. CHICAGO and 10, on bottom of container and FEDERAL TOOL CORP. CHICAGO, MADE IN USA on one chipper blade. Red top and red handle. Label on the jar has the following markings - FEDERAL Practical HOUSEWARES, ICE CHOPPER, CRACK AND CRUSH 6-8 CUBES. H - 9-5/8", Ten chipping points. FEDERAL TOOL CORP. CHICAGO, 5112, and 8 on the bottom of the container. FEDERAL TOOL CORP. CHICAGO, MADE IN USA. On the side of the chipper blade. H - 13-3/4", Nine picks on the end of ice breaking shaft. SCHULTZ BRASS MFG. CO. NORWOOD, OHIO, PAT. PEND. on the bottom side of the pick support. There are no markings on the glass container. 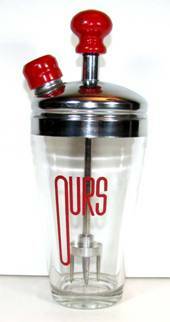 Chrome top and has a screened spout with a red cap, OURS on the side of the glass container. No other markings. The chipper has 5 tines on a circular support.